This is a short biographical essay I wrote on John Bachman, who was one of the more important contemporary critics of Samuel George Morton and polygenism. Bachman, John (1790-1874). 2010. Dictionary of Early American Philosophers. Thoemmes Continuum. 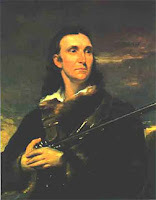 Clergyman, educator, and naturalist, John Bachman was born in Rhinebeck, N. Y. on February 4, 1790. While a young student in Philadelphia, Bachman became acquainted with several noted naturalists such as Alexander von Humboldt and began a lifelong study of Natural History. During this same period, Bachman abandoned the study of law in favor of the Lutheran ministry and in 1814 began what would become his lifelong position as pastor of St. John's Church in Charleston, S. C. These events frame Bachman's important contributions to the great debates on Natural History and human origins. They would also determine his involvement in matters of education, secession, and the Civil War. 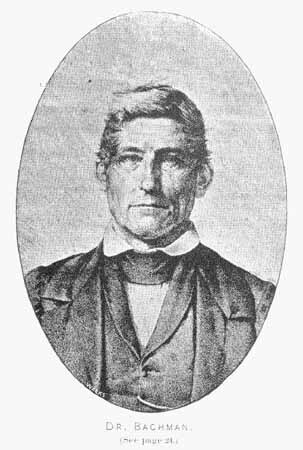 John Bachman died in Charleston, S. C. on February 24, 1874. Bachman spent 56 years as the pastor of St. John's. He was noted for his innovations and social reforms during the decades leading up to emancipation and Civil War. He baptized free Blacks and allowed them into the congregation. The congregation remained segregated, as was its school, but by 1860, free Blacks constituted 35 percent of the congregation. Bachman trained and ordained the first three African-American Lutheran ministers, one of whom would become president of Wiberforce University and another the Chief Justice of the Supreme Court of Liberia. Bachman opposed succession, but he supported what he termed “the institutions of South Carolina.” He recited the opening prayer of the secessionist session of the South Carolina legislature. His essay “The Duty of the Planter to his Family, to Society, and his Country” deplored profiteering and warned planters and manufacturers that “If you join the extortioners in high prices, you will effect our subjugation by your avarice, and bring destruction on our beloved Southland. We are all engaged in the same noble, patriotic, and Christian cause.” In the 1860 census, Bachman is recorded as owning 4 slaves, and his wife Maria as owning one. In the same year as the publication of the final folio of Viviparous Quadrupeds, Bachman was drawn fully into the major dispute amongst pre-Darwinian naturalists: the origin of human diversity. The polygenic theory of human origins held that the “races” were actually separate species with independent origins. This theory was espoused by leading naturalists of the day, such as Samuel Morton and Louis Agassiz. It had gained near universal scientific consensus by the time that Josiah Nott and Gliddon published their summation of the theory in Types of Mankind. As the leading advocates of the polygenic theory, the so-called American School of Ethnology had achieved international recognition. Bachman remained staunchly committed to the view that all humans shared a common origin, or monogenesis. While most defenders of monogenism had based their views on religious feeling or scriptural authority, Bachman's opposition to the polygenic theory arose from his own scientific work and observations. He had already published an essay on “hybrid” (“mixed-race”) humans, arguing for a common human origin and he now critically reviewed the craniological work of Samuel Morton, the polygenism of Agassiz, and the popularizations of Nott and Gliddon. The polygenic theory held sway until Charles Darwin published his Origin of Species, but John Bachman should be remembered as the most formidable adversary of polygenism. In the course of his defense of a single human origin, Bachman approached Darwin's views on the adaptation of species to changes in their environment. He was, however, prevented from realizing Darwin's insight by his belief in a Designer and a design of the natural world and so he refused to allow for the workings of chance in adaptation. As his opposition to polygenism was being condemned by other naturalists, Bachman continued an active life. Between 1856 and 1860, he helped found Newberry College in Newberry, S.C. and served as its first president. The publication of Origin brought an end to the polygenic theory, and Natural History was quickly replaced by biology, anthropology, and sociology. Bachman, like the dispute over the polygenic theory which figured so prominently in his scientific work, belonged to the passing era of Natural History. 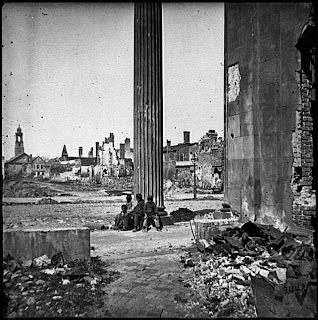 Charleston, S. C., 1865. The ruins of Bachman's church are in the background. 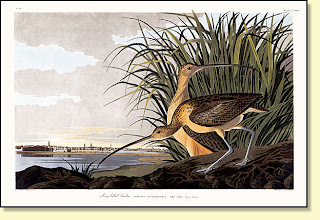 “On the Migration of the Birds of North America . Read before the Literary and Philosophical Society of Charleston, S.C. March 15th, 1833,” American Journal of Science 30 (1836). Catalogue of Phænogmous Plants and Ferns native or naturalized, found Growing in the vicinity of Charleston, South Carolina (Charleston, S.C. 1834). Observations on the Changes of Colour in Birds and Quadrupeds (Charleston, S.C., 1838). The Viviparous Quadrupeds of North America, with James Audubon (New York,1846). An Investigation of the Cases of Hybridity in Animals on Record, considered in reference to the Unity of the Humans Species (Charleston, S.C., 1850). The Doctrine of the Unity of the Human Race, examined on the Principles of Science (Charleston, S.C. 1850). “For the Courier [regarding the Unity of the Human Race],” The Charleston Courier May 28, 1850. “Diversity of the Human Race,” Debow’s Southern and Western Review 10 (1851). A Notice of the “Types of Mankind,” with an examination of the charges contained in the biography of Dr. Morton, published by Nott and Gliddon (Charleston, S.C. 1854). “The Duty of the Planter to his Family, to Society, and his Country,” Charleston Daily Courier (March 25, 1862). Gossett, Thomas. Race: the History of an Idea in America (Dallas, 1963). Gould, Stephen Jay. The Mismeasure of Man, 2nd Edition (New York, 1999). Stanton, William. The Leopard’s Spots: Scientific Attitudes Toward Race in America 1815-59 (Chicago, 1960). Stephens, Lester D. Science, Race, and Religion in the American South: John Bachman and the Charleston Circle of Naturalists, 1815-1895 (Chapel Hill, N.C., 2000).